Not to be confused with Gora dialect. For other uses, see Gorani (disambiguation). Gorani (also Gurani) is a group of Northwestern Iranian dialects spoken by Kurdish people in the southernmost parts of Iranian Kurdistan and the Iraqi Kurdistan region. It is classified as a member of the Zaza–Gorani branch of the Northwestern Iranian languages. Gorani is a dialect of the Pahlawani strand of Kurdish, which diverged off from Kurmanji speakers, Badhini and Sorani alike, at around 100 BCE. 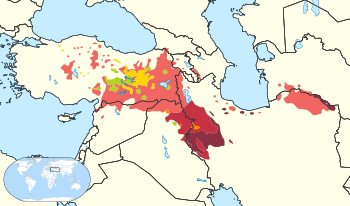 The Hewramî dialect, although often considered a sub-dialect of Gorani, is a very distinct dialect spoken by Gorani/Hewrami people in a region called Hewraman along the Iran–Iraq border, and is sometimes considered to be a distinct language. The variations between the Pahlawani strand and the Kurmanji strands of Kurdish are too many, and are therefore far too great by any standard linguistic criteria to warrant classification as dialects of the same languages, though speakers from both sides can understand each other for the most part. Gorani is spoken in the southwestern corner of province of Kurdistan and northwestern corner of province of Kermanshah in Iran, and in parts of the Halabja region in Iraqi Kurdistan and the Hawraman mountains between Iran and Iraq. Gorani was once an important literary language in the southeastern parts of the Kurdistan geographical region but has since been replaced by Sorani. In the 19th century, Gorani as a language was slowly replaced by Sorani in several cities, both in Iran and Iraq. Today, Sorani is the primary language spoken in cities including Kirkuk, Meriwan, and Halabja, which are still considered part of the greater Goran region. The name Goran appears to be of Indo-Iranian origin. The name may be derived from the old Avestan word, gairi, which means mountain. The word Gorani refers to inhabitants of the mountains or highlanders as the suffix -i means from. The word has been used to describe mountainous regions and the regions' communities in modern Kurdish literary texts. The Koran in Gorani, translated in the 20th century by Haci Nuri Eli Ilahi (Nuri Eli Shah). There are also large communities of people of Ahl-e Haqq in some regions of Iranian Azerbaijan. The town of Ilkhichi (İlxıçı), which is located 87 km south west of Tabriz is almost entirely populated by Yâresânis. For political reasons, one of which was to create a distinct identity for these communities, they have not been called Goran Kurds since the early 20th century. They are called under the various names, such as Ali-Ilahis and Ahl-e Haqq. Groups with similar beliefs also exist in Iranian Kurdistan. Interestingly, both the Dersim (Zazaki) people and the Gorani people, adhere to a form of Yazdanism. These people are called under the various names, such as Ali-Ilahis and Ahl-e Haqq. Groups with similar beliefs also exist in all parts of Kurdistan. ↑ Hammarström, Harald; Forkel, Robert; Haspelmath, Martin; Bank, Sebastian, eds. (2016). "Gurani". Glottolog 2.7. Jena: Max Planck Institute for the Science of Human History. ↑ Edmonds, Cecil. Kurds, Turks, and Arabs: politics, travel, and research in northeastern Iraq, 1919-1925. Oxford University Press, 1957. 1 2 Izady, Mehrdad R. (1992). The Kurds: A concise Handbook. London: Taylor and Francis. p. 170. ↑ "A Comprehensive study of Hawrami Kurdish : UNESCO-CULTURE". ↑ Peterson, Joseph H. "Avestan Dictionary". ↑ Nyberg, H.S. (1923), The Pahlavi documents of Avroman, Le Monde Oriental, XVII, p.189.